Just enter your email address in the form below and I’ll send you your free eBook as well as all kinds of tips and practical inforamtion for getting into a great shape and living the heathier and fuller life. ** Privacy Assured: Your email address is never shared with anyone. Hello, My name is Dr. Saman Bakhtiar and I want to personally welcome you to Chino Hills Boot Camp and Personal Training blog. Over the years I have helped thousands of your family and friends right here in Chino / Chino Hills get in the best shape of their lives and I want to do the same for you. This blog is designed to help Chino/Chino Hills residence lose weight, feel great and add years to their lives. I absolutely love being a personal trainer because it allows me to change lives. So let’s get started ……. My expert team of Chino Hills Boot Camp Instructors and Personal Trainers are eager to serve you and get you results you always wanted. This is Anabolic Alex here. There is habit that I see at ALL LEVELS of physiques among clients and friends involved in the fitness industry. And it is something that will make you unhappy, frustrated, and continually dissatisfied. No way to live life, especially not at the Transformation Center. This habit is focusing on perfection. One person complains and another person complains in response. At its core, this is just a negative cycle. And it is no way to live. Nor is it a way to be excited about your physique. This isn’t limited to people who are “out of shape” this goes for everyone, especially those at the highest levels. I know firsthand that this drive to perfection will help you make progress, but you will never appreciate what you have because you are always focused on the next goal. And if the whole point is to be happy with how you look, you will actually NEVER be happy with how you look unless you fall in love with PROGRESS OVER PERFECTION. Loving PROGRESS is about falling in love with the PROCESS. Fall in love with the way it makes you feel, the way accomplishing something difficult makes you feel stronger and more capable. And when that happens, you will realize that you will slowly begin to see changes in your physique because you are not focused in the daily swings in the scale and understand its just part of a bigger process. You will never reach a point and say “Ok. I’m done now.” There will always be more to do. So don’t set your goals as perfection, just set them as progress. You will feel better about how you look and you will not see the mirror or the scale as this vicious judge, but rather, just another means of measuring progress. And if you start seeing your physique in this light, you will be able to make better long term progress and enjoy yourself while doing it and not get stressed out about small steps back like vacations etc. when you are supposed to be enjoying life, and not worried about your diet, right? Far too many people set the goal to build more lean muscle mass but then fail to meet those goals because they’re missing some vital elements that keep them back from results. Let’s have a quick look at three reasons you may not be building muscle so that you know what you should be on the lookout for. The very first reason you may not be seeing the muscle building results you’re after is if you’re not eating enough. Make no mistake about it, you need calories to grow and if those calories aren’t coming in, you won’t be growing. 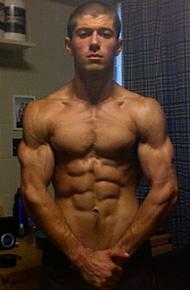 You must consume at least 250 calories or so over maintenance value to start to see your muscle growth rates increase. Next, another reason you may not be growing is if you’re not resting enough. You think the more exercise you can do in the gym on a regular basis, the faster you will see results. What you need to know here however is that if you’re not resting, you’re not giving your body time to repair the damage. This means growth will also slow down. Rest is a vital part of the growth process because it’s when you’re resting that your muscles are actually getting stronger. Finally, the last reason that you may not be seeing the muscle building results you’re after is if you’re doing the same workout over and over again. It’s vital that you’re changing things around every few days whether it be new exercises, more weight, less rest, and so on. It’s this change that is going to bring about better overall growth rates, so not something to take lightly. If you’re just instead doing the same workout in the gym day after day, your body will simply maintain the status quo. You want to get stronger and bigger, not maintain the status quo. Implement some changes and you’ll see better results. So there you have three top reasons why you may not be building lean muscle mass. If any of these are at play for you, make sure that you make some key changes to get them resolved so that you can start moving forward. Before you decide to get going on your healthy diet, it’s vital that you get yourself into the proper mindset to begin. Those who don’t begin their diet with the right mindset are going to be far more likely to fall off the bandwagon a few weeks in than those who are fully committed and ready to face any challenge head-on. This said, let’s go over what you need to be doing to ensure that you are in fact in the proper frame of mind. The first thing that you must be ready to do is accept mistakes. If you are expecting yourself to be absolutely perfect as you go about this process, you’re setting yourself up for problems from the very start. Mistakes will happen and it’s how you deal with those that determines your success. Second, you also need to be more focused on effort than on outcome. Weight loss is rarely linear and instead, you will see faster periods of weight loss and slower periods of weight loss. If you let every little slump throw you off entirely, you’re never going to move forward and see the results that you’re after. Focus on giving maximum effort. That is what you can control. Don’t focus on something that is out of your control or you will end up feeling powerless. It’s also vital that you’re prepared to be flexible in your approach. Life will always happen and it may get in the way at times with the diet you’re using. You need to be flexible in dealing with this. You want to be able to adjust your diet as you go along depending on what life throws your way. If your diet is so rigid that one small slip-up throws the entire thing off track, you likely won’t be following that diet for long. Finally, you need to be focused on long-term thinking. This is not going to be a quick-fix, but rather, changes that you are making from here forward. If you’re ready to abandon the habits you’re adopting right now as soon as you reach your goal weight, chances are you won’t be reaching your goal weight in the first place. So keep these points in mind and make sure that you are setting yourself up for success by getting in the right frame of mind. It really will make all the difference. If you’re getting tired of hitting the gym day in and day out and want to incorporate some additional exercises into your fitness plan, weekend excursions are a perfect idea. These will get you out and active, all while bringing back the enjoyment that you may be missing in your workout routine. While working with a good personal trainer is definitely vital to preventing workout boredom, sometimes it’s just a change of scenery that you really need. Let’s go over some quick weekend activities that you should consider trying out that will all test your fitness level and take it to new levels. The very first activity to get in is a simple hike up a local hilly area or mountain. Hiking is great because it’s lower impact if you’re a runner and are often pounding the pavement and it’ll also help to build up your lower body strength as well. If you’re hiking quite intensely, you can easily burn up to 600 calories or more per workout, so don’t think that it’s one that won’t bring fat loss results – even though you’re walking, it’s still very intense. Kayaking is another fun outdoor adventure to try out that will build up your upper body strength as well as your core. Going out on the water can make for the perfect afternoon activity that will also provide great stress relief at the same time. This sport will also test your reaction time quite heavily as you’ll need to be reacting very quickly to each wave that comes your way. Finally, the last activity to consider getting in is road cycling. Even if you do typically do cycling exercise while in the gym, getting out on a real bike and cycling on the open road will offer a while new experience to your training while boosting your fitness level dramatically. You may even consider entering a cycling race if you really want to step your motivation up a notch and make sure that you stay fully committed to your program plan. So next time you’re looking for something to do on the weekend, consider any one of these activities. They’ll all take your fitness up a step and add more excitement into your workout plan.